Since Sephora introduced the Rewards Bazaar about a year ago, I have been saving up my points in hopes to get one of the coveted larger-point perks. The problem is that you have to be on, right at noon (EST) every single Tuesday and Thursday, otherwise you are out of luck! Its risky because you never know what rewards will be released on which days, and because the quantities are so limited for Canadians that any reward worth redeeming is sold out before it even uploads to my browser. I love that they’ve introduced regards at various levels such as 750, 1000, 1500, 3000 points and beyond! Its also great that these reward levels will ship free, so you don’t have to make an impulse purchase just to redeem them. Well, I was finally able to redeem for something that I really wanted! I exchanged 1500 points for the Discover your Replica reward. 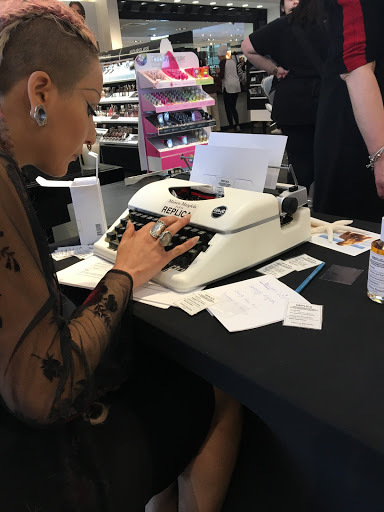 When I redeemed, the Details section online explained that this would include a personalized scent consultation at Sephora Toronto Eaton Centre and a full sized bottle of any Replica Eau de Toilette. 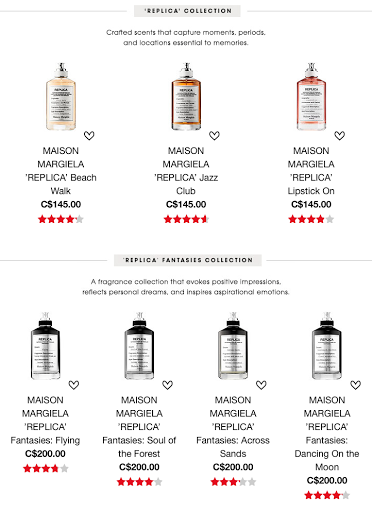 I’ll be honest, when I redeemed, I was hoping I would be able to get one of the Replica: Fantasies fragrances (which are $55 more expensive than the standard line). When I read the fine print, I realized that these are considered Eau de Perfums and not Eau de Toilettes. Even so, I was still happy to get a full sized bottle worth $145 for 1500 points, as opposed to many rewards at this level which contain sample sized products. When I got to the Sephora store on the day of my appointment, I was happy to learn that the Details section on the Rewards Bazaar was indeed wrong! 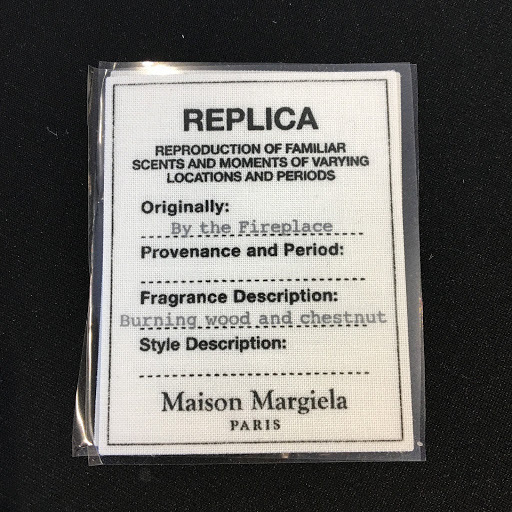 This reward also came with a rollerball sized fragrance of Maison Margiela’s cult favourite Beach Walk (a $30 value). Then came the fun part, I got to choose my very own fragrance from their line! 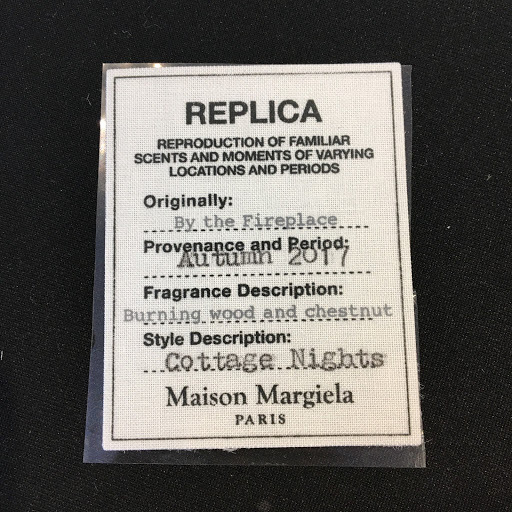 The concept behind the replica line is to create fragrances that evoke a specific memory, taking you back to that very moment in time. Each apothecary-style bottle is printed with a label that explains the inspiration for the scent, including the place and period in which it took place. After exploring the entire line, I fell in love with By the Fireplace. As someone who solely wears fruity florals, this is very different for me! It is a delicious unisex fragrance that is so very warm and comforting. It reminds me of being at the cottage, sitting by a bonfire, and that smoky scent that gets infused into your hair and clothes. My friends and I always joked of making a campfire-scented perfume, so I was instantly intoxicated by this scent and the memories attached with it. 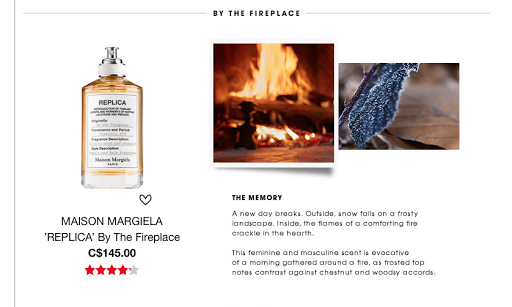 It has notes of pink peppercorn, chestnuts, clove, balsam, and vanilla. Part of the reward was to have a personalized label for the bottle created for you. The fragrance consultant asked me how I would describe this scent and a period I wanted to associate with it. She typed up my personal cotton label using a vintage typewriter. I loved this touch! It makes the bottle mine. All in all, I thought this was well worth the points! I loved that I got an entire experience, a memory that I will associate with this perfume every time I wear it. In terms of value, I received a full-sized bottle of By the Fireplace, a rollerball of Beach Walk, a sea shell-shaped white chocolate lollipop, some samples of other Replica fragrances, and a customized consultation. The products themselves were $175 in exchange for 1500 points. If we only include standard points, that is 1 point per dollar spent (not triple point promotions, etc), then this is a 12% return in value. The fragrance is very warm, so I will be saving it for when the weather turns cold, and will wear it all fall and winter! Have you redeemed any perks from the Rewards Bazaar? Tell me about it below! Previous Post Generation Beauty 2017 Experience, Review, and Haul!